German Chancellor Merkel and French President Sarkozy probably thought they’d be basking in glory at the G-20 summit in Cannes. After all they’d stood tough and rightly figured they’d made the Euro banks an offer they couldn’t refuse, bargaining for a 50% payout on outstanding Greek debt. The one loose screw turned out to be the Greeks. 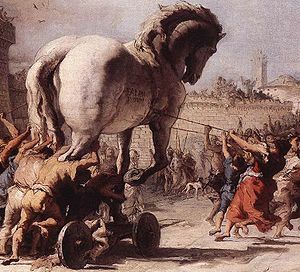 It was a little like the old Trojan horse that had worked for the Greeks 4000 years before. The motto might be don’t look a gift horse in the mouth. The shaky Papandreou government unwittingly produced its own Trojan horse just as the clock struck midnight and Cinderella was reduced to tatters in the form of a referendum. The people would have to approve the deal. Papandreou knew his fun loving Greeks were never going to approve a program which deprived them of eros, in the broadest sense of the word. The proud Greeks were not going to have Europe holding their fate in its hands, in a way that was not dissimilar to where the Versailles Treaty had left the once equally proud Germans. So what would have been the upshot or downside as it were? Greece defaults, forswears the Euro and departs from the EU to become a Third World country, leaving the Euro banks holding the bag and the world wide economy in a shambles. For now the referendum idea has been tabled.